There's not much happening over here, writing-wise, unfortunately. I'm still entrenched in a book I'm helping one of my clients publish, and it's severely cut into my own writing time. I'm ready to be done with it so I can get back to my own stuff, but I think the end is still a ways away. 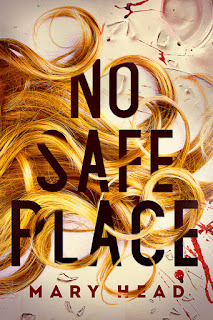 On the bright side, No Safe Place will be on sale next month! I wanted to do a sale in January, but the money didn't quite work out for buying promos, but my tax refund should be depositing this week, so I'll be able to submit for a few promos. The sale will run March 9 through March 16 (coinciding with the dates Hannah was missing in the book), so mark your calendars and tell your friends! I also meant to do a sale on The Only One for Valentine's Day, but I've been busy with work and other things and it just completely slipped my mind to try to plan it, but I'm going to try to schedule one, maybe for April (perhaps for my birthday, who knows). Well, it's New Year's Eve. I hope everybody had a wonderful holiday, whatever you celebrate. I had a nice Christmas in Colorado with my family, and didn't particularly want to come home, and not just because the highs here in Florida are currently in the 70's. 2018 didn't feel like a very productive year for me. I finished Crimson Hollow Book 1, got my rights back on No Safe Place, and had a fairly successful sale on Finding Home Again over Christmas, but apart from that, this year was just a little lacking. I'm hopeful that 2019 will be better. I want to try to get better about promoting my books, now that they're all under my control again, and I'm hoping that I can finish Crimson Hollow Book 2 and start working on Book 3. I also want to get the No Safe Place/Finding Home Again wedding short published sometime early in the year. Well, I didn't win NaNo this year. November was weirdly busy and I had a lot of trouble focusing on writing (or on anything, really, as it took this long for me to even make this post...). I did get about 21k written in Crimson Hollow Book 2, so I at least did something, just not as much as I'd wanted. Finding Home Again goes on sale this week, and I'm excited about it. I've booked a handful of promos, and I'm hoping they pay off. And a little additional treat for those of you who are fans of Hannah and Eli from No Safe Place and Finding Home Again, I'm planning to release a wedding short story some time early next year, so stay tuned for updates on that! As always, Patreon subscribers get first peeks at excerpts and cover reveals, so consider becoming a Patron; $1 a month gets you access to cover reveals, and $5 gets you excerpts.